I was born in 1987 and I call myself a Lean Entrepreneur who is in motion - here is my list of projects. My academic background includes an exchange student year at a High School in the USA. I studied "Business Economics and Service Management Consulting" at the Corporate University of IBM in Stuttgart. In 2013, I left my first startup, a p2p-Carsharing Service. Here, I worked for almost two years learning about and practicing customer development. Afterwards I pursued my studies at the "School of Design Thinking" in Stanford and Berlin. I am a certified Lean Launchpad Educator by serial founder Steve Blank. I published the German translation of his Bestseller "The Startup Owner's Manual". People invite me for talks, workshops and trainings in Design Thinking, Startup Communities, Lean Startup and Business Innovation. I was part of Alexander Osterwalders’ Strategyzer Team from 2014 to 2015. Alexander is the author of the bestseller "Business Model Generation". In 2016 I have become a partner at MAK3it to help companies be innovative and work the same way as Startups. I have worked with international organizations like ebay, School of Design Thinking, Startup Weekend (UP Global, now Techstars), Bayer, Drägerwerk, TÜV and the MedTech Incubator in Tübingen. I love Product Design, Experiments and Validation and Google Design Sprints. I enjoy meeting people and pay it forward by supporting the local Startup Community, running non-profit events like Leancamp, NEXT and Startup Weekend. I'm also passionate about the sharing economy, open technologies and I love to explore the world. 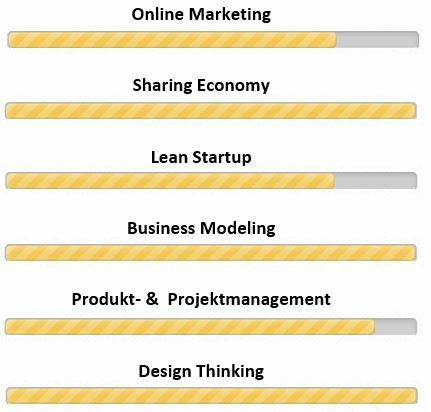 In 2018, after the altMBA and rocking new, exciting and meaningful projects I will complete my master's degree in Intra- & Entrepreneurship at the University of Stuttgart. Find me on LinkedIn, feel free to follow me on twitter, tumblr or contact me.